The Precision Time Protocol (PTP) is a protocol used to synchronize clocks in a network. When used in conjunction with hardware support, PTP is capable of sub-microsecond accuracy, which is far better than is normally obtainable with NTP. PTP support is divided between the kernel and user space. The kernel in Fedora includes support for PTP clocks, which are provided by network drivers. The actual implementation of the protocol is known as linuxptp, a PTPv2 implementation according to the IEEE standard 1588 for Linux. The linuxptp package includes the ptp4l and phc2sys programs for clock synchronization. The ptp4l program implements the PTP boundary clock and ordinary clock. With hardware time stamping, it is used to synchronize the PTP hardware clock to the master clock, and with software time stamping it synchronizes the system clock to the master clock. The phc2sys program is needed only with hardware time stamping, for synchronizing the system clock to the PTP hardware clock on the network interface card (NIC). The clocks synchronized by PTP are organized in a master-slave hierarchy. The slaves are synchronized to their masters which may be slaves to their own masters. The hierarchy is created and updated automatically by the best master clock (BMC) algorithm, which runs on every clock. When a clock has only one port, it can be master or slave, such a clock is called an ordinary clock (OC). A clock with multiple ports can be master on one port and slave on another, such a clock is called a boundary clock (BC). The top-level master is called the grandmaster clock, which can be synchronized by using a Global Positioning System (GPS) time source. By using a GPS-based time source, disparate networks can be synchronized with a high-degree of accuracy. One of the main advantages that PTP has over the Network Time Protocol (NTP) is hardware support present in various network interface controllers (NIC) and network switches. This specialized hardware allows PTP to account for delays in message transfer, and greatly improves the accuracy of time synchronization. While it is possible to use non-PTP enabled hardware components within the network, this will often cause an increase in jitter or introduce an asymmetry in the delay resulting in synchronization inaccuracies, which add up with multiple non-PTP aware components used in the communication path. To achieve the best possible accuracy, it is recommended that all networking components between PTP clocks are PTP hardware enabled. Time synchronization in larger networks where not all of the networking hardware supports PTP might be better suited for NTP. With hardware PTP support, the NIC has its own on-board clock, which is used to time stamp the received and transmitted PTP messages. It is this on-board clock that is synchronized to the PTP master, and the computer’s system clock is synchronized to the PTP hardware clock on the NIC. With software PTP support, the system clock is used to time stamp the PTP messages and it is synchronized to the PTP master directly. Hardware PTP support provides better accuracy since the NIC can time stamp the PTP packets at the exact moment they are sent and received while software PTP support requires additional processing of the PTP packets by the operating system. In order to use PTP, the kernel network driver for the intended interface has to support either software or hardware time stamping capabilities. Where em3 is the interface you want to check. This will install ptp4l and phc2sys. Do not run more than one service to set the system clock’s time at the same time. If you intend to serve PTP time using NTP, see Serving PTP Time with NTP. The ptp4l program can be started from the command line or it can be started as a service. When running as a service, options are specified in the /etc/sysconfig/ptp4l file. Options required for use both by the service and on the command line should be specified in the /etc/ptp4l.conf file. The /etc/sysconfig/ptp4l file includes the -f /etc/ptp4l.conf command line option, which causes the ptp4l program to read the /etc/ptp4l.conf file and process the options it contains. The use of the /etc/ptp4l.conf is explained in Specifying a Configuration File. More information on the different ptp4l options and the configuration file settings can be found in the ptp4l(8) man page. The master offset value is the measured offset from the master in nanoseconds. The s0, s1, s2 strings indicate the different clock servo states: s0 is unlocked, s1 is clock step and s2 is locked. Once the servo is in the locked state (s2), the clock will not be stepped (only slowly adjusted) unless the pi_offset_const option is set to a positive value in the configuration file (described in the ptp4l(8) man page). The adj value is the frequency adjustment of the clock in parts per billion (ppb). The path delay value is the estimated delay of the synchronization messages sent from the master in nanoseconds. Port 0 is a Unix domain socket used for local PTP management. Port 1 is the em3 interface (based on the example above.) INITIALIZING, LISTENING, UNCALIBRATED and SLAVE are some of possible port states which change on the INITIALIZE, RS_SLAVE, MASTER_CLOCK_SELECTED events. In the last state change message, the port state changed from UNCALIBRATED to SLAVE indicating successful synchronization with a PTP master clock. When running as a service, options are specified in the /etc/sysconfig/ptp4l file. More information on the different ptp4l options and the configuration file settings can be found in the ptp4l(8) man page. By default, messages are sent to /var/log/messages. However, specifying the -m option enables logging to standard output which can be useful for debugging purposes. The -P selects the peer-to-peer (P2P) delay measurement mechanism. The P2P mechanism is preferred as it reacts to changes in the network topology faster, and may be more accurate in measuring the delay, than other mechanisms. The P2P mechanism can only be used in topologies where each port exchanges PTP messages with at most one other P2P port. It must be supported and used by all hardware, including transparent clocks, on the communication path. The -E selects the end-to-end (E2E) delay measurement mechanism. This is the default. The E2E mechanism is also referred to as the delay "request-response" mechanism. The -A enables automatic selection of the delay measurement mechanism. The automatic option starts ptp4l in E2E mode. It will change to P2P mode if a peer delay request is received. When a peer delay request is received on a port using the E2E mechanism. When a E2E delay request is received on a port using the P2P mechanism. The command line options and other options, which cannot be set on the command line, can be set in an optional configuration file. stepsRemoved is the number of communication paths to the grandmaster clock. offsetFromMaster and master_offset is the last measured offset of the clock from the master in nanoseconds. meanPathDelay is the estimated delay of the synchronization messages sent from the master in nanoseconds. if gmPresent is true, the PTP clock is synchronized to a master, the local clock is not the grandmaster clock. gmIdentity is the grandmaster’s identity. Additional information is available in the pmc(8) man page. The -a option causes phc2sys to read the clocks to be synchronized from the ptp4l application. It will follow changes in the PTP port states, adjusting the synchronization between the NIC hardware clocks accordingly. The system clock is not synchronized, unless the -r option is also specified. If you want the system clock to be eligible to become a time source, specify the -r option twice. Under normal circumstances, use systemctl commands to start, stop, and restart the phc2sys service. The -a option causes phc2sys to read the clocks to be synchronized from the ptp4l application. If you want the system clock to be eligible to become a time source, specify the -r option twice. The -w option waits for the running ptp4l application to synchronize the PTP clock and then retrieves the TAI to UTC offset from ptp4l. Once the phc2sys servo is in a locked state, the clock will not be stepped, unless the -S option is used. This means that the phc2sys program should be started after the ptp4l program has synchronized the PTP hardware clock. However, with -w, it is not necessary to start phc2sys after ptp4l as it will wait for it to synchronize the clock. When running as a service, options are specified in the /etc/sysconfig/phc2sys file. More information on the different phc2sys options can be found in the phc2sys(8) man page. Note that the examples in this section assume the command is run on a slave system or slave port. 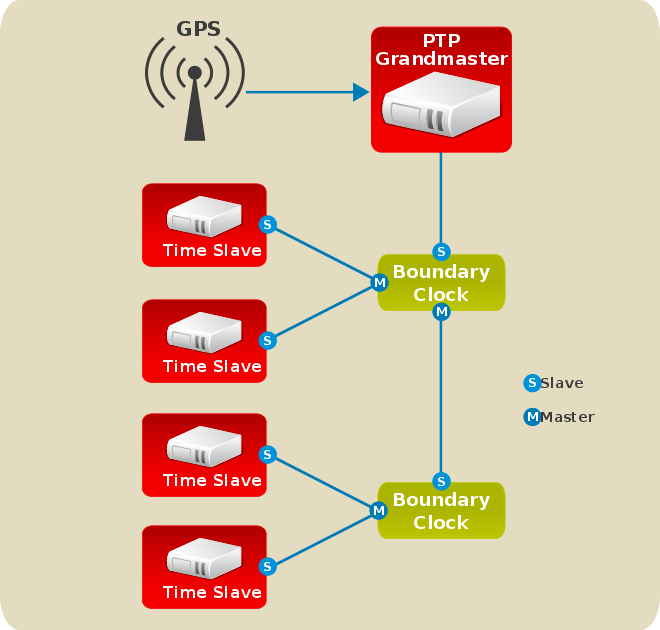 When there are multiple PTP domains available on the network, or fallback to NTP is needed, the timemaster program can be used to synchronize the system clock to all available time sources. The PTP time is provided by phc2sys and ptp4l via shared memory driver (SHM reference clocks to chronyd or ntpd (depending on the NTP daemon that has been configured on the system). The NTP daemon can then compare all time sources, both PTP and NTP, and use the best sources to synchronize the system clock. On start, timemaster reads a configuration file that specifies the NTP and PTP time sources, checks which network interfaces have their own or share a PTP hardware clock (PHC), generates configuration files for ptp4l and chronyd or ntpd, and starts the ptp4l, phc2sys, and chronyd or ntpd processes as needed. It will remove the generated configuration files on exit. It writes configuration files for chronyd, ntpd, and ptp4l to /var/run/timemaster/. This will read the options in /etc/timemaster.conf. Fedora provides a default /etc/timemaster.conf file with a number of sections containing default options. The section headings are enclosed in brackets. This is an example of an NTP server section, "ntp-server.local" is an example of a host name for an NTP server on the local LAN. Add more sections as required using a host name or IP address as part of the section name. Note that the short polling values in that example section are not suitable for a public server, see Configuring_NTP_Using_ntpd.adoc#ch-Configuring_NTP_Using_ntpd for an explanation of suitable minpoll and maxpoll values. A "PTP domain" is a group of one or more PTP clocks that synchronize to each other. They may or may not be synchronized to clocks in another domain. Clocks that are configured with the same domain number make up the domain. This includes a PTP grandmaster clock. The domain number in each "PTP domain" section needs to correspond to one of the PTP domains configured on the network. An instance of ptp4l is started for every interface which has its own PTP clock and hardware time stamping is enabled automatically. Interfaces that support hardware time stamping have a PTP clock (PHC) attached, however it is possible for a group of interfaces on a NIC to share a PHC. A separate ptp4l instance will be started for each group of interfaces sharing the same PHC and for each interface that supports only software time stamping. All ptp4l instances are configured to run as a slave. If an interface with hardware time stamping is specified in more than one PTP domain, then only the first ptp4l instance created will have hardware time stamping enabled. The default timemaster configuration includes the system ntpd and chrony configuration (/etc/ntp.conf or /etc/chronyd.conf) in order to include the configuration of access restrictions and authentication keys. That means any NTP servers specified there will be used with timemaster too. [ntp_server ntp-server.local] — Specify polling intervals for this server. Create additional sections as required. Include the host name or IP address in the section heading. [ptp_domain 0] — Specify interfaces that have PTP clocks configured for this domain. Create additional sections with, the appropriate domain number, as required. [timemaster] — Specify the NTP daemon to be used. Possible values are chronyd and ntpd. [chrony.conf] — Specify any additional settings to be copied to the configuration file generated for chronyd. [ntp.conf] — Specify any additional settings to be copied to the configuration file generated for ntpd. [ptp4l.conf] — Specify options to be copied to the configuration file generated for ptp4l. [chronyd] — Specify any additional settings to be passed on the command line to chronyd. [ntpd] — Specify any additional settings to be passed on the command line to ntpd. [phc2sys] — Specify any additional settings to be passed on the command line to phc2sys. [ptp4l] — Specify any additional settings to be passed on the command line to all instances of ptp4l. The section headings and there contents are explained in detail in the timemaster(8) manual page. For each NTP server you want to control using timemaster, create [ntp_server address] sections . Note that the short polling values in the example section are not suitable for a public server, see Configuring_NTP_Using_ntpd.adoc#ch-Configuring_NTP_Using_ntpd for an explanation of suitable minpoll and maxpoll values. If required to use ntpd as the NTP daemon on this system, change the default entry in the [timemaster] section from chronyd to ntpd. See Configuring_NTP_Using_the_chrony_Suite.adoc#ch-Configuring_NTP_Using_the_chrony_Suite for information on the differences between ntpd and chronyd. If using chronyd as the NTP server on this system, add any additional options below the default include /etc/chrony.conf entry in the [chrony.conf] section. Edit the default include entry if the path to /etc/chrony.conf is known to have changed. If using ntpd as the NTP server on this system, add any additional options below the default include /etc/ntp.conf entry in the [ntp.conf] section. Edit the default include entry if the path to /etc/ntp.conf is known to have changed. In the [ptp4l.conf] section, add any options to be copied to the configuration file generated for ptp4l. This chapter documents common options and more information is available in the ptp4l(8) manual page. In the [chronyd] section, add any command line options to be passed to chronyd when called by timemaster. See Configuring_NTP_Using_the_chrony_Suite.adoc#ch-Configuring_NTP_Using_the_chrony_Suite for information on using chronyd. In the [ntpd] section, add any command line options to be passed to ntpd when called by timemaster. See Configuring_NTP_Using_ntpd.adoc#ch-Configuring_NTP_Using_ntpd for information on using ntpd. In the [phc2sys] section, add any command line options to be passed to phc2sys when called by timemaster. This chapter documents common options and more information is available in the phy2sys(8) manual page. In the [ptp4l] section, add any command line options to be passed to ptp4l when called by timemaster. This chapter documents common options and more information is available in the ptp4l(8) manual page. Previously, test results indicated that disabling the tickless kernel capability could significantly improve the stability of the system clock, and thus improve the PTP synchronization accuracy (at the cost of increased power consumption). The kernel tickless mode can be disabled by adding nohz=off to the kernel boot option parameters. However, recent improvements applied to kernel-3.10.0-197.fc21 have greatly improved the stability of the system clock and the difference in stability of the clock with and without nohz=off should be much smaller now for most users. The following sources of information provide additional resources regarding PTP and the ptp4l tools. ptp4l(8) man page — Describes ptp4l options including the format of the configuration file. pmc(8) man page — Describes the PTP management client and its command options. phc2sys(8) man page — Describes a tool for synchronizing the system clock to a PTP hardware clock (PHC). timemaster(8) man page — Describes a program that uses ptp4l and phc2sys to synchronize the system clock using chronyd or ntpd.